One morning Chapman was asked how he was feeling. “I’m burdened this morning!” was his reply. This passage reminds us of three very important points about this “spiritual burden” for which we can be thankful. (1) The basis of our blessings. God is the source of all blessings. He is the giver of good gifts. He knows our needs before we ask. He’s the great provider. All blessings originate with Him. He is the fountain from which all blessings flow. But the text is even more specific. God’s blessings spoken of in this text are “in Christ.” This expression is found 5 times in this chapter, and 12 times in this short treatise. It was written to “the faithful in Christ.” Those who “first trusted in Christ.” And who are “one in Christ.” To be “in Christ” is to enjoy a relationship with Him. And have access to the Father’s blessings. (2) The breadth of our blessings. Chapman is right. The blessings in Christ are an “overabundance.” Paul says that we enjoy “every spiritual blessing.” How many? ALL! 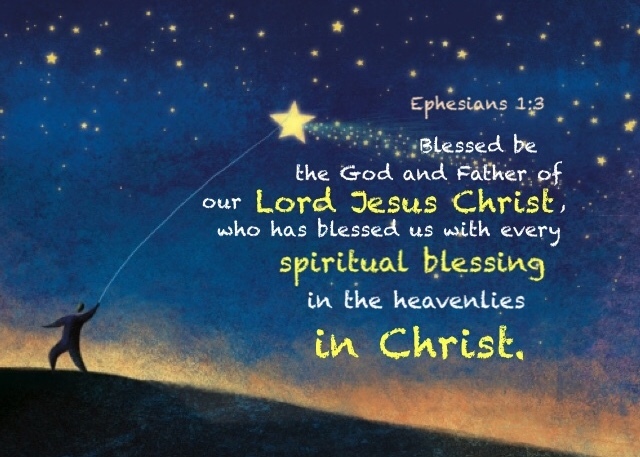 Later in Ephesians 3:20 the apostle says that God is able to do “exceedingly abundantly above all that we can ask or think.” The greatest of God’s blessings are showered upon us in a “superabundance.” God blesses us in a measure that is beyond our comprehension or imagination. God’s ability is immense. His power is infinite. The riches of His grace are immeasurable. And His desire to bless us is incompressible. (3) The boundary of our blessings. The Christian lives in two worlds and operates in two different realms. The physical and the spiritual. The earthly and the heavenly. While we live in the world, we are not “of the world.” We have been elevated to sit with Christ in the heavenly realm (Eph 2:6). This chapter reminds us that we are blessed that God chose us in Christ, adopted us as his children, accepted us and has provided “redemption through his blood, the forgiveness of sin.” As a result, we enjoy spiritual insight into the “mystery of his will.” We have an eternal inheritance reserved for us in heaven. And it is guaranteed by the gift of the Holy Spirit. What incredible blessings! Plus the privilege of prayer, freedom from the guilt of sin, a purpose for living, a guidebook to direct us, fellowship with like-minded believers, and a sustaining hope that overcomes the hardships of this life. While we ought to be thankful for the many physical and material blessings we enjoy in life, let us overflow with gratitude for God’s gracious spiritual gifts. Woo Hoo! This deserves a shout out. Great insight.